With Arizona's diverse educational landscape, prospective students from all backgrounds can find a great fit for college. The state is home to over 24 four-year institutions and 21 community colleges. Some students may be interested in big public universities like Arizona State University, while others may seek a smaller, private education from an institution like Grand Canyon University. 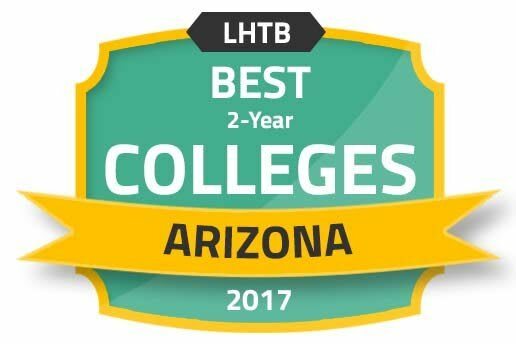 Keep reading to see which Arizona colleges took the top spots in our rankings, compare Arizona college costs against the national average, learn about college readiness programs, and find other resources to help make a smart college decision. There are key differences among colleges in Arizona that push some above the rest. We've performed a comprehensive evaluation of Arizona colleges based on essential criteria to create an unbiased ranking of the state's best two- and four-year colleges. Students can compare these top-ranked institutions on features like alumni earnings, tuition cost, financial aid, student-to-teacher ratio, and graduation rate. Finding the right fit in a university is a critical step for an applicant. There are many things to consider, and the decision-making process should be careful and deliberate. When searching for and deciding on a school, students should consider many things, including their desired field of study, financial aid opportunities, student population, and public or private school type. The search tool below allows students to narrow this search according to these facts, making the decision process easier. Arizona is committed to improving student outcomes at all education levels, including college. Each university and community college has an outreach program designed to support college-readiness, as do several state organizations. The following state and private initiatives are available to students and parents planning for college. This state-sponsored plan from the Arizona Commission for Postsecondary offers families a flexible and tax-advantaged way to save for college. Parents or grandparents can start tax-exempt accounts for their future college students. Funds can be used at any institution accredited by the U.S. Department of Education, plus a handful of international programs. Savings plans start at as little as $15 a month. Arizona Race to the Top is the state's education reform program, funded by a $25 million grant from the U.S. Department of Education. The goals of the program are to implement college and career readiness standards through educational training programs, to establish five regional centers of education to provide support and to ensure education reform. This Arizona Department of Education program aims to produce more Arizona high school graduates by improving residents' drop-out rate. It recognizes that all students should have equal access to opportunities and resources, and that all districts should have multiple ways for students to find success. The program leads the Education and Career Action Plan and offers an online toolkit that keeps students on track. Other online resources include strategies for dropout prevention and early warning signs and systems. The Science Foundation of Arizona (SFAZ) is a non-profit organization seeks to diversify the economy by through an education system that aligns with state needs. The organization has given $110 million in support of more than 150 individual grants. Its STEM (Science, Technology, Engineering, and Math) initiatives have helped more than 385,000 students. SFAZ focuses primarily on rural schools. The cost of an Arizona college degree depends on a number of factors, including residency, program type, course load and school choice. The graphic below will help prospective applicants compare Arizona college costs with those on the national level, and give an accurate idea of the percentage of students that receive financial aid. College affordability is not simply a matter of tuition, though that certainly plays a role. Excellent financial aid, costs of living and other expenses all contribute to one’s final cost—and the amount of education debt they’ll likely carry. The information below highlights which Arizona colleges score best on overall net price. Many students' top priority when selecting schools and majors is their long-term return on investment. Graduates may have student loan debt to pay off in addition to real-life expenses. Some universities in Arizona also have high job placement rates, usually through highly-ranked degree programs. The comparison below provides a snapshot of graduates' median annual earnings by school, and how they compare to the national average. The Arizona Commission for Postsecondary Education reports that students received nearly $2.5 million in financial aid in 2015. There are a number aid sources available to Arizona students, including federal grants and loans, private scholarships, and university- or department-specific. Graduates of the following universities in Arizona tend to carry the least amount of educational debt. Arizona has no shortage of enticing college towns, but its average cost of living exceeds the national average. Like other states, some cities or regions are more affordable than others — something to consider when budgeting for college. See how the five most populous cities in Arizona compare in characteristics like housing, food, utilities and health care. The American Psychological Association accredits counseling and psychology programs at University of Arizona, Arizona State University, and Midwestern University. The Council on Academic Accreditation certifies the speech-pathology program at Northern Arizona University. Commission on Collegiate Nursing Education accredits the nursing programs at Brookline College, the University of Arizona and the University of Phoenix. Fairbanks, which has a population of 32,469, offers two- and four-year college programs at the University of Alaska, Fairbanks. Some key industries in the city are manufacturing, construction, leisure and hospitality, and health services. The University of Alaska, Fairbanks has 9,870 graduate and undergraduate students enrolled at its nine colleges and schools, such as the School of Education, the School of Management, the School of Fisheries and Ocean Sciences, and the College of Natural Science and Mathematics. UAF offers 146 degree and 31 certificate options, with psychology, biology, and public administration among the most popular. With 2,784 faculty members, the school boasts small class sizes that allow students to get individualized attention. Many Arizona colleges call Tucson, the state's second-largest city, home. The U.S. Census Bureau estimated a metropolitan population exceeding 1 million in 2010. Tucson's unique college vibe is perfect for nature lovers, history buffs and art enthusiasts. PCC is an open-admissions institution that aims to provide an affordable education. It has six campuses in the across the Tucson metro, which extend college access and give students more options. In addition to associate-level degree programs, PCC offers workforce development, career training programs, and adult education. Established in 1885 as the state's first university, U of A draws 50,000 students and faculty members from around the world. A global leader in research, it claims 100 percent of undergraduates will get a chance to conduct hands-on research or gain internship experience before they graduate. The college offers more than 300 individual programs. Potential applicants to Arizona colleges should take advantage of the multitude of resources available online. Every university has a website with corresponding information on degree programs and financial aid. Additionally, there are many external, objective sources from which to draw information, including the state's accreditation agencies and organizations for higher education. Here a few to get started. This program is committed to motivating students to complete an enriched high school education. The goal is for students to be better prepared for postsecondary education and the workforce. Committed to expanding access to all students and improving postsecondary education, ACPE offers a college and career guide, FAFSA courses and college application seminars. The Department provides a wealth of information for students of all ages and their families. Learn more about post-secondary standards and evaluation, programs for increasing opportunity and access, and career development opportunities. ASBE fosters excellence in all levels of public institutions state-wide. It is charged with regulating the conduct of the school system, and has a lot of great resources for students preparing for college. This hub connects prospective students with different Arizona college options and provides information on every public and tribal community college or university across the state. The Arizona Department of Education's College and University Resource Center provides contact information for higher education boards and commissions, state universities, community colleges, and private schools. This website offers information on Arizona colleges, financial aid programs, benefits for veterans and specialty programs for students of all kinds.